Today was a bad day. Or rather today was a great day, but I behaved poorly. Our house is for sale and a showing was booked for this afternoon. That meant a lot of cleaning. Despite what some people think, our house is clean, cluttered, lived in maybe, but clean. I very rarely tell the girls to pick up their toys. I don’t see the point. First, most of their games extend from day to day. 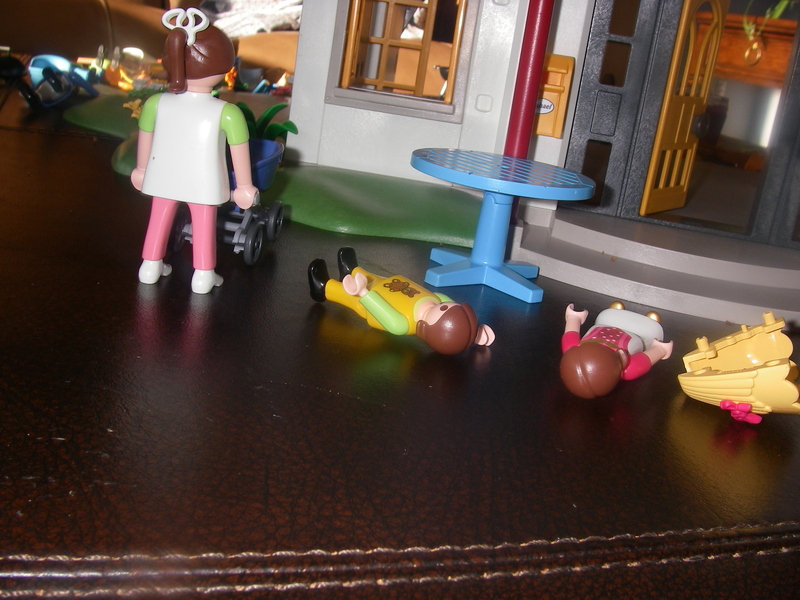 They have both little people and playmobil play sets. This week Ella set up an entire city, including landscaping. At the end of the day her game wasn’t over. I could’ve forced her to put the buildings and people away, but it would’ve resulted in a lot of tears – and she’d have been upset too. Instead the city stayed out and the next day she ran downstairs, passed the TV, and picked up where she left off. If I put the toys away the night before, she might not have pulled them all out again. Her chance to explore her imaginary world to it’s full extent might’ve been denied. Her city remained set up for just over a week, out of everyone else’s way, but easy for her to play with. Last night I put it all away so we could show the house today. 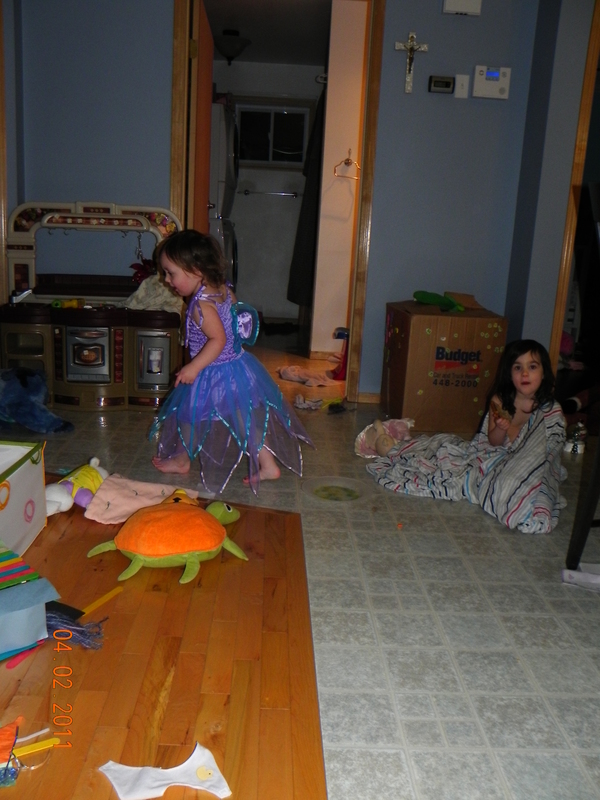 Today the girls woke up to a (mostly) tidy house. They knew why everything was put away, and they tried to keep it that way. But to two little girls who’re used to using pretty much whatever they want, whenever they want, clean means only one or two toys at a time. And that’s when I behaved badly. I can give a million reasons (excuses) why I did it, but none of them really matter. What matters is I could’ve done things differently and we could’ve had a wonderful day together. I got hung up on making the house clean, I forgot that my little girls love to help and would have, if only I invited them to join me. Instead I pushed them away every time they got close. I finally told (yelled at) them to sit on the couch, not move, and watch shows until it was time to go. I could’ve given them both rags and asked them to help wash the floors. I could’ve given Ella the mop and she’d have happily spent an hour doing nothing other than washing floors. I know that about them on a daily basis, yet today I forgot and by forgetting I told them their help wasn’t good enough. But even worse than that: I yelled at them. All they wanted was to help me and I pushed them away. Ryan ended up getting up and rescuing the girls. Once I calmed down and sat on the couch with the girls, Ella turned to me and said, “Mommy, you used your angry voice with me. I didn’t like it, so I used my angry voice with you. Now that you’re using your calm voice with me, I’ll use my calm voice with you.” She then proceeded to tell me she just wanted to help, but I was too busy yelling to hear her offer. I wish I were as wise as my four year old.